Effective collaboration between Intel employees enables them to share innovative ideas—a significant factor in Intel’s competitive advantage. Intel IT has long been a key enabler of collaboration solutions for our enterprise and we continually seek ways to improve the experience for Intel employees, empowering them to bring their innovative concepts to life. With our ongoing deployment ...of the Intel Unite® solution, we have made significant gains in making collaboration easier and faster. This solution has had such a positive impact on productivity that we have already deployed it to 3,500 rooms and plan to upgrade at least 4,000 conference rooms worldwide by mid-2017—representing a total potential savings of about 180,000 productivity hours. The Intel Unite solution is now standard for any new or renovated Intel facility. • Eliminates cables, dongles, and adapters that make connecting devices to displays complicated. Meetings start faster and productive time is increased. • Supports remote participation in the meeting by letting employees share content directly from their client device from anywhere in the world. • Helps Intel IT keep conference room display-sharing fully operational through remote support and proactive issue identification and remediation. Over the last 18 months, the Intel Unite solution was used by employees for 2.5 million presentations, representing nearly 922,000 hours of content-sharing. 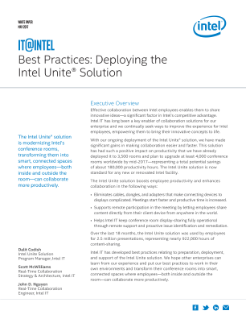 Intel IT has developed best practices relating to preparation, deployment, and support of the Intel Unite solution. We hope other enterprises can learn from our experience and put our best practices to work in their own environments and transform their conference rooms into smart, connected spaces where employees—both inside and outside the room—can collaborate more productively.